nature of the walk : Undulating field paths and tracks, which can be muddy at this time of year. PARK Line-marked parking in the village square at Church Brough. Today’s gently undulating ‘in the vale’ expedition follows one of the East Cumbria Countryside Project’s carefully crafted ‘Discover Eden’ Walks, the route is consistently way-marked and affirmed by their delightful colourful flying kingfisher logo. ECCP have produced an excellent illustrated guide (£2), on sale locally. En route keep an eye out for each of the seven attractive bronze motifs set on top of posts. 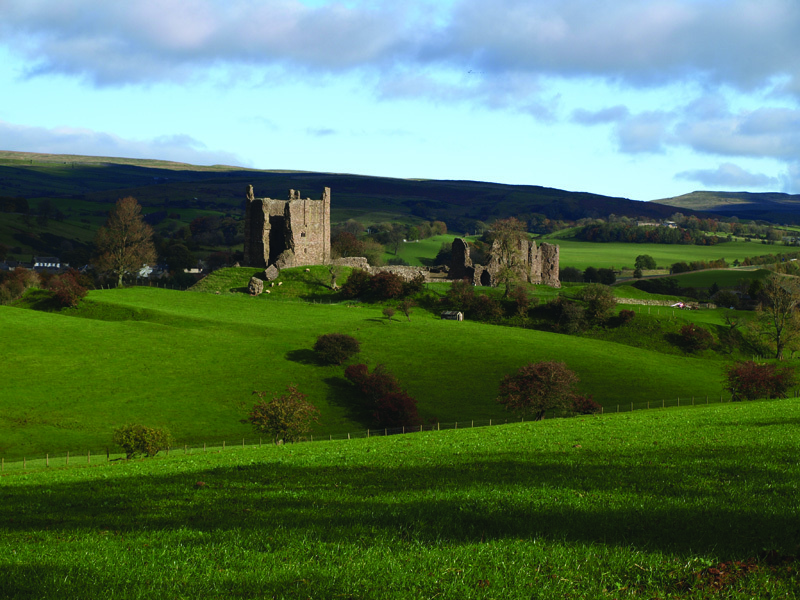 Divided by the lorry infested A66, Market Brough and Church Brough are located in a once strategic location - at the point where the arterial Roman Road from York to Carlisle (in the volatile west), enters the Eden vale after the wild crossing of Stainmore. This is the land of the west moorland folk, the people who inhabited the realm of the Helm Wind, that periodic bitter, unrelenting wind that can cascade down the high Pennine scarp when an east wind prevails. 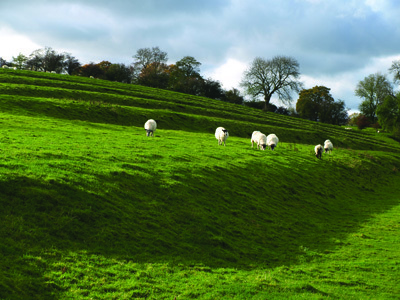 Verterae Roman Fort is the first evidence of military defence in this area its outline can still be seen below the Norman castle, which in turn commanded the continued life of the important trans-Pennine trade route. The rumbling sound of the lorries, overlaid during weekdays by the rhythmic chatter of machine guns and exploding bombs, give a hint of what it must be like to live in a war zone: the result of training activities on the MOD’s Warcop ranges. For all that the air is charged with anger and rage, the walk succeeds in soothing the spirit as one drifts through a historically rich landscape, where farming and nature have worked hand in hand over countless generations. Leave the rectangular square in Church Brough at Wiend Cottage, at the south-western corner, following the lane which passes the path to St Michael’s Church. One should make time to look at this lovely old ecclesiastic building (normally open from 10am to 4pm), its western aspect is quite amazing, long and low, its sturdy masonry culminating upon a massive tower, the fine-mullioned windows lending a pleasing grace to a classic Eden edifice. The continuing lane slips through a red sandstone cutting, the tilted strata weather-hollowed at its lower end. Behind the house ‘Manderley’ stands the old vicarage, a considerable building in its own right. Fork right at the gate in the dip and follow the track up to a gate entering a level hedged lane. 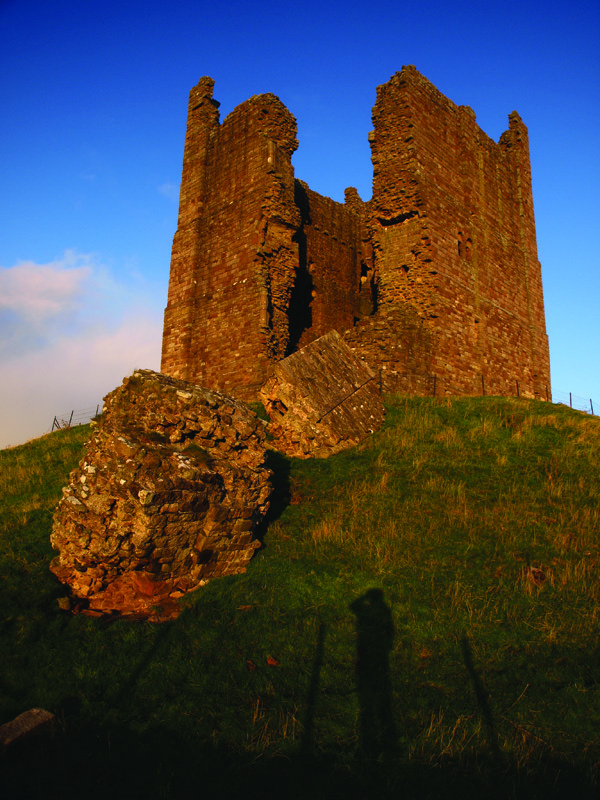 From this ridge-top passage Brough Castle can be seen in all its dramatic strategic glory with the square-cornered platform of Verterae in front of the keep. Elsewhere the great upper Eden landscape of fells and rolling country stretch around the compass with Nine Standards Rigg, Mallerstang, Wild Boar and the Howgills, all comparatively low profile, as are the more distant Far Eastern Fells of Lakeland. However, the prominent limestone bluffs of the west-facing Pennine escarpment beyond the A66 take the one’s attention. You may spot Fox Tower, a curiosity that could be mistaken for an industrial ruin. Perched above Hellbeck Wood, a notable native ash wood, the building is nought but an eighteenth century folly. The lane ends at a gate, and the track swings left to a stone barn. Do not go through the facing gate, instead bear right by the fence to a bridle-gate (tight latch) in the field corner. A short hollow-way draws out onto the low pasture with attention now drawn half-right to a lined bank. This is replicated further to the left more distantly, what you are seeing is medieval cultivation terracing, where oats and root crops were grown on the dry fertile south-facing slope. Advance straight across the field to a metal field-gate. With Swindale Beck coming close to the right the footpath keeps beside the fence on the left. 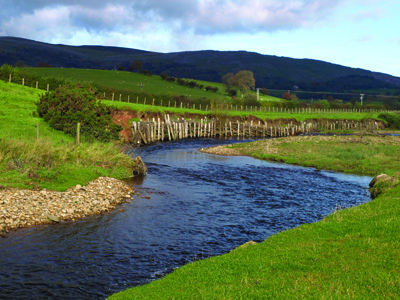 The beck exhibits normal erosion effects undermining a length of fencing and on the far bank where there has been a determined attempt to stem the river-bank loss with the insertion of brushwood behind stakes. Advance with the hedge on the left to reach a solitary mature ash tree by a gate (and green metal footpath sign devoid of destination information!). Here the route effectively turns tail left, but as Chris Tarrant would say in ‘Who wants to be a Millionaire’ we don’t want you to do that! Instead march on to visit Great Musgrave. A gate gives access onto a fenced farm lane. Turn right crossing the Swindale Beck bridge with its rounded turret-like posts to meet the minor road at Hallgarth Farm. The activities of the local mole-catcher are evident on the fence left, by the www.go-wild.org.uk trout fishing access car parking. Located on the site of the oldest known farm in the area, Hallgarth was original home of the de Musgrave family, the adjacent strip lynchet bank indicative of former agricultural life in the immediate area. Follow the road left to enter Great Musgrave by the renovated cottage Edenholme dated1687. Pass up the street by the village hall, spot the now rare yellow AA plate on the wall of the last house on the left. So now you know London is a handy 265¾ miles from where you stand, measured from Hyde Park Corner, via Scotch Corner and the A1 – the route based on the Roman road system. As the road forks bear left ‘no through road’ sign by the green. 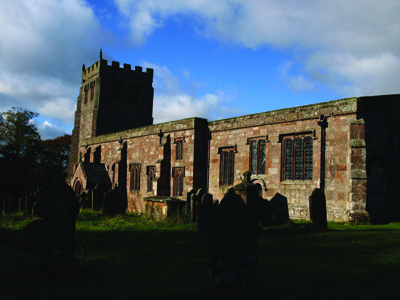 To visit St Theobald’s Church follow the footpath sign, where the road forks again enter a hedge-confined metalled footway down to the church, hugging the fast- flowing waters of the Eden. Backtrack to continue the walk. Now take the left fork lane leading to the row of cottages, footpath sign ‘Hallgarth’. Through the first gate veer immediately left through the metal hand-gate and passing to the left of the cottage row cross a wall-stile. Go forward through the old hedge. Descending the pasture ridge gives an intimate view of the cultivation terracing, one cannot be sure of its age, but just for the moment allow your mind to visualise the draught oxen at work. 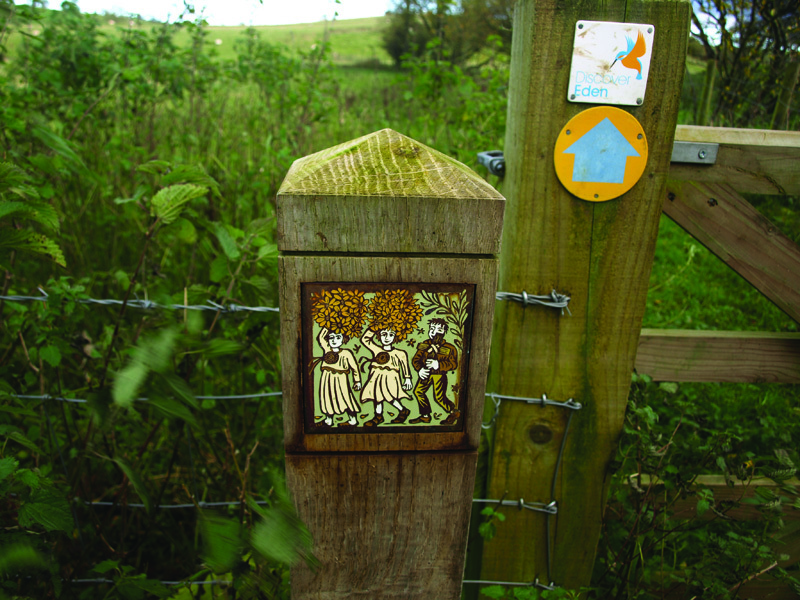 Go through the gate back onto the road at Hallgarth, retrace your steps over the bridge to the gate entry into the meadow (with a lovely oyster-catcher motif post at hand) and back down the field to THAT ash tree! Passing through the gate traverse the faintly rigg and furrowed pasture, pass close by the lone oak tree to a galvanised field gate in a fence continuing to a wooden bridle-gate in the field corner. Directly below the bank-top is Heanings House – ‘heaning’ meant ’land fenced off for hay’. Advance by the fence to a gate. Turn right, enter the pasture valley, pass through a gate at an awkward fence junction. Continue beyond where the main sike turns right, below the power lines, to a gate by a cress-filled stream. Proceed by a fenced, marshy area, with Knocking Tofts farm buildings resting on the near horizon. A farm of many animals - I spotted sheep, geese and red deer, and herd pigs. Leave the damp valley via a ditch culvert go right at the gate. Bear half-left to a stile, cross a newly re-seeded pasture part right to a gate beside a crab apple tree. A track follows leading via two gates onto the main road at Brough Sowerby. 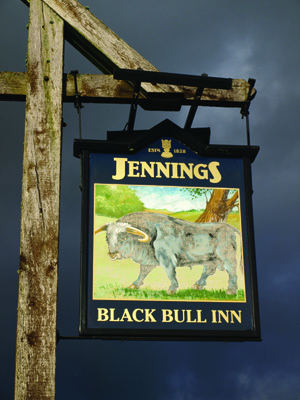 Go right, to the road junction - perhaps taking full advantage of the Black Bull Inn, with food and a good pint of Jennings assured. Take the road signed ‘Barras 3’ leading through the village, spot the rustic ‘Brunton Park’ football pitch. The road ventures out onto the confined but wild common, with evidence of a bonfire, being built with hedge trimmings as I strode by. Pass an old milk stand and an impressive farm-sign ‘Hollins View Farm’ inscribed upon a re-located monster erratic boulder. The unmanaged rough fringe of the common has all the potential to harbour a wealth of wild flowers. Before the woodland section note the footpath sign directing to a curious farm-name ‘Bloan’, possibly a combination of the Celtic ‘blaen’ and Norse ‘Blean’ meaning ‘valley pasture’, in this instance referring to the River Belah. The wood-fringed road rises, and then declines to a crossroads. Turn left; after three hundred yards arrive upon a pair of access tracks leading right, take the first with its footpath fingerpost. This track leads down to High Park House; bear left between the foundations of the new barns bearing down right to a stile adjacent to the new embankment and beside the main farm. Follow the track by the green freight wagon and below the garden to the left of two field gates. Enter the large rushy meadow; advance parallel to the right-hand fence to find a stile in the far hedge. 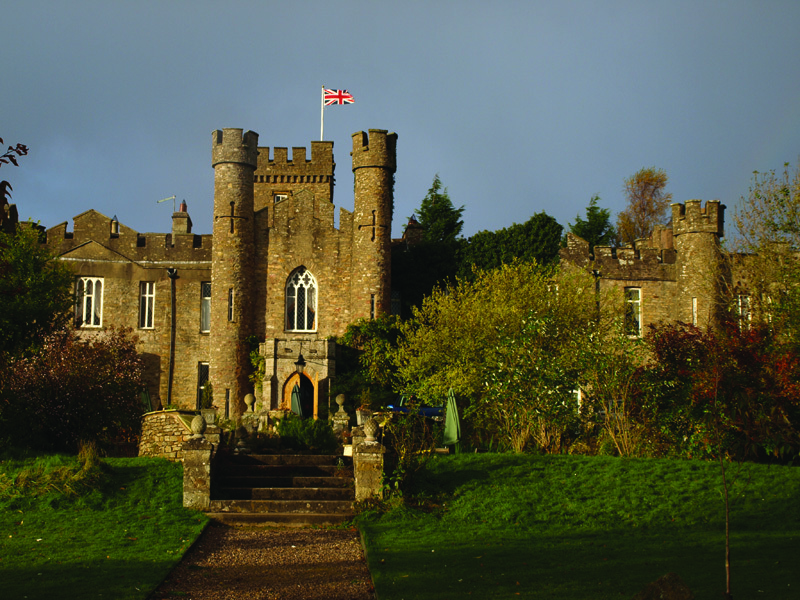 Arrive upon the drive alongside the impressive folly of Augill Castle Hotel, (the following description comes from the VisitCumbria website) “Take two feuding brothers, add in a small fortune, stir vigorously, allow to simmer and you get a folly castle. 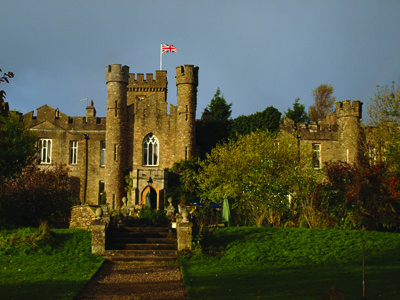 Augill was built in 1841 by John Bagot Pearson from Kirkby Lonsdale, in a bid to outdo his younger sibling. He succeeded in some style, commissioning the Victorian folly castle as a weekend fantasy retreat in which to entertain his friends. It is a triumph of vanity over common sense: turrets, mullioned windows, castellated towers, wonderfully ornate lattice windows – the usual castle fare. It is also a tromp-d’œil of sorts - the house is mostly one room deep. In 1997 it was a run-down mess, but was bought by Simon and Wendy Bennett, who have since dedicated their lives to creating a place that’s grand in design and conception (Jacobean oak panelling, huge fires, a gorgeous embossed dining room), but easy and informal in atmosphere”. Avoiding stepping on the hens pass over the drive to a field gate, follow the hotel bounding hedge right, within a fenced paddock, to the a gate with a finch pecking a teazle motif post. 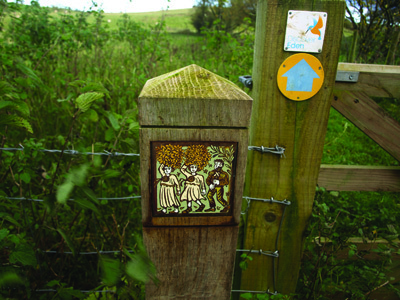 Cross the field to a gate into a horse paddock, keep the fence close right then follow the way-marks which avoid the cottage left, to find a stile into a farm-track. Go right as into the farmyard, but turn left via the gate into a field, advance with the tall hedge close left. Cross the fence stile some thirty yards right of the field corner. Go straight ahead following the beck with a stone barn over to the right. Ignore the inviting footbridge over the beck, bear slightly right to cross the more substantial footbridge spanning Swinside Beck. Follow the riverbank path onto the concrete footway under the A685 bridge, keep right via a gate into a paddock and cross a stile up the bank onto the road re-entering Church Brough left. Having undertaken the six-mile round one may finally conclude the ultimate objective was just paces from the parked car, the great Norman castle itself (entry free), which deserves to be examined in all its glorious dimensions. Do make a point of walking around the moat as a grand finale and be impressed by the stirring setting. The Golden Fleece and Castle Hotel, plus a chippy in Market Brough, with the unlikely sounding, but none-the-less welcome Tanjong Cottage Tearoom at the entrance to Brough Castle.